The most popular lures for bonito and false albacore can be broken into three categories: metals, soft plastic baits and epoxy jigs. 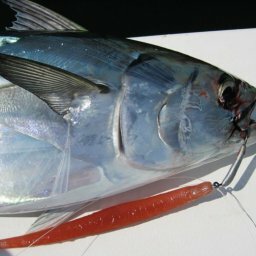 Metal lures such as Deadly Dicks, Swedish Pimples and stingers are perhaps the most commonly used lures for bonito and false albacore, but in my opinion, with the development of soft plastic and epoxy-based lures, the metals are now practically obsolete. While they still work just as well as they always have, it’s simply hard to beat some of the specialized finishes and actions of the plastic counterparts. Pros: These metal lures are readily available, they are very easy to cast, are very durable and obviously, are the appropriate size for replicating the baitfish that bonito and albies eat. When To Use: Super windy conditions: The larger size will not only make casting easier but the larger size will be easier for the bonito and albies to see. Soft Baits have become very popular for bonito and false albacore. Although they come in just about every shape and size you can imagine, I tend to double size the soft baits compared to what the albies are eating. At first I made this upgrade to increase casting distance but I quickly found that the larger baits attracted more fish than smaller, more naturally sized baits. My theory is that the larger baits stick out from the school of baitfish a little bit. The commotion of a larger soft bait ripping across the surface is great for blind casting; the commotion draws attention and the larger bait size is offers enough food to make the effort worthwhile for the fish. Pros: One major upside is that soft baits are available in translucent colors. My all-time favorite is the amber color made by Hogy Lure Company. Unlike metal lures they don’t sink very fast and that means you can keep your lure in the strike zone longer. They also have a very natural quiver that looks so lifelike. Another plus for soft baits is they can be finished weedless, which comes in handy if the wind is strong and the water is churned up. If casting weight is an issue, you can add a little extra weight with a swim bait hook. Cons: Even though “lightly weighting” soft baits increases casting distance, they are still not the best in terms of casting. It’s hard to beat the casting distance of a metal or an epoxy jig. When to Use: Flat calm water: My go-to would be a 7inch soft bait tied directly with Yozuri Hybrid line. If I’m using braid I would use a 4-foot leader. You can make a lot of commotion on the surface with an unweighted soft bait – a great technique for blind casting. With selective fish, lighten up with the 4.6-inch Hogy Sand Eel if you can cast it far enough with your outfit. Although they may be a bit hard to find, Hogy Epoxy Jigs offer some of the best of both worlds between a metal lure and a soft bait. They have the casting distance of the metal due to their shape and weight relative to their size, but with the epoxy coating they have a very natural translucency that is a major plus with soft baits. Pros: With the epoxy finish, the light refracts through the clear coat similarly to that of a live baitfish’ scales and coating. The epoxy is lighter than metal so it can be fish very slowly with a subsurface walk-the-dog action. Scattered fish: Best way to catch scattered bonito and albies is to blind cast. In this situation I always say bigger is better, as the bigger the lure the easier it is to see. Also larger lures cast farther, allowing you to cover more ground and present to more fish. I would go with a 60-gram Hogy Epoxy Jig. Finicky schools that are hard to reach: 15 or 20-gram Hogy Epoxy Jig as you’ll need the distance to get your lure right in front of the fish without getting too close in the boat, spooking them.